The focal point of this piece is the lands in Co Meath mentioned in the 1705 will of Samuel JACKSON (1631-1706). After several generations, these leases ended up being owned by the NORTH family of Jackson Hall, Kirkby Lonsdale, Westmorland. Updated November 6, 2018. Map update. NOTE: The 1659 Census of Meath has names of owners of some lands mentioned here. Samuel JACKSON was one of the first generation of a family of JACKSONs who emigrated to Coleraine from Kirby Lonsdale, Westmorland, England in the mid-1600s, and then to Dublin. Although Samuel JACKSON had apprenticed with the Drapers Guild, his family gained their foothold in Ireland as a result of the substantial Clothworkers Guild land grants. The first members of this family probably first came to Ireland as early as Elizabethan times. SEE: Timeline of Jacksons of Coleraine. This Samuel JACKSON was a son of Rev. Richard JACKSON and his wife Dorothy OTWAY. Rev. Richard JACKSON had a 2nd wife and between the two marriages sired at least 23 children. Many of them as well as their descendants settled in Ireland. There are still outstanding questions whether they may also be related to the other JACKSON families who settled in Drogheda, Lisnabo, Dublin and Coleraine in the late 1600s and early 1700s. It would not be surprising if the Londonderry & Coleraine JACKSONs turn out to be connected to both the mid-1600s JACKSONs of Drogheda, as well as the Quaker JACKSONs whose relations include two known brothers: Anthony JACKSON (1628- abt 1690) and Richard JACKSON (1626-1679). Parish of Kilbeg, Barony of Lower Kells: townlands of Ardlonan, & Marvelstown. Parish of Staholmog, Barony of Lower Kells: townlands of Drakerath aka Drakerath, Castletown More aka Castletownmoor,, & Emlagh. The top three shaded parishes beneath are where the JACKSON of Lisnabo held leases. The bottom 3 are where Samuel JACKSON and his descendants held leases. The distance from top to bottom is about 13-15 km. This map was added in 2015. It clarifies the parishes shown on the right where Samuel JACKSON held leases. 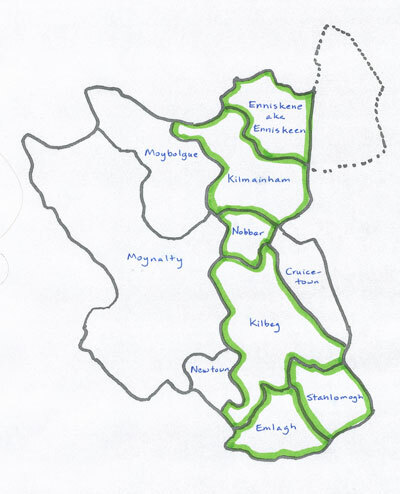 From top to bottom the green shaded parishes are: Enniskene, Kilmainhan, Nobber (which also continues into the neighbouring Barony of Morgallion), Kilbeg, and Emlagh & Staholnog. Cruisetown, also mentioned in this post is on the eastern border of Kilbeg. NOTE: Newtown was added to the Jackson family holdings sometime btw 1705-1733. I have updated what I know about Samuel Jackson's holdings with what I have learned since 2013. In his will, Emlogh was a townland holding, not a parish - but it is also the parish where the townland of Reask is - a townland held by Rev. Robert Jackson, one of Samuel Jackson's nephews. I have also added the Parish of Teltown. I made and added the map beneath on November 2, 2018. The pie-shaped leases in the bottom right hand corner inrigue me. It seems that it once contained a water source, but current satellite photos show it to be more of a bog. What is curious is that they are all close to each other, but not all adjacent. Parish of Kilbeg: townlands of Ardlonan, & Marvelstown. 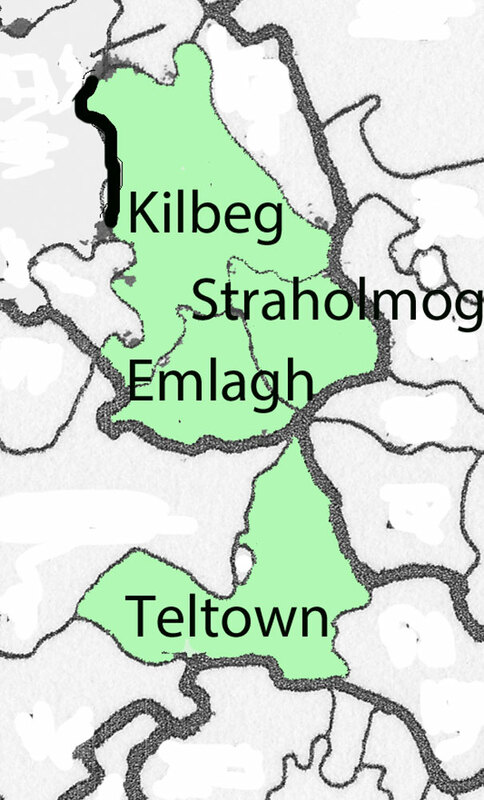 Parish of Staholmog: townlands of Drakerath aka Drakerath, Castletown More aka Castletownmoor,, & Emlagh. I have circled Samuel JACKON's holdings in red. In the tables beneath, I have also included some PIPPARD leases. There are a number of business and marriage connections between the JACKSONs and PIPPARDS in Drogheda. Both were merchant families, and both served on the Drogheda Council in the late 1600s. The Rev. Robert JACKSON, mentioned in dealings with them, was a nephew of the Samuel JACKSON (1631-1706) of Dublin, who held the earlier leases. He was a son of Nathaniel JACKSON. Parish of Staholnog, Barony of Lower Kells. According to the Down Survey Maps, this Parish was owned by James FLEMING sr, Thomas NUGENT, Patrick HUSSEY & Walter DRAKE. John DRAKE owned Drakrath and Thomas NUGENT owned Castletownmore. Between 1641 and 1670, 33 acres of Drakerath were transferred from John DRAKE to Coll Daniell REDMOND. 20 acres of Drishog aka Farranalcock, Parish Kilobeg were transferred from Walter DRAKE to Coll Daniell REDMOND. PEPPARD, Jacob. City of Dublin. By lease & release dated 10 & 11 May 1708, John WILLETT (son and heir of Richard WILLETT), sold to said Jacob PEPPARD for £130 Cloghmacoe, Barony Moyergallen, Co Meath, also reciting whereas Walter REILLY alleges the said Richard WILLET did by indenture 27 Feb 1691 demise all his Lands in Ireland to John WILLETT had granted Jacob PEPPARD an annuity of £3 pa charged on the rest of his estate to cover the Quit Rent & Crown Rent. Walter REILY of Castletown, Kilpatrick, Co. Meath alleges that said Richard WILLET, deceased of Islington, Middlesex, by deed dated 27 Feb 1691, demised all his property in Ireland to said John WILLETT for 99 years. Walter REILY also claims that said Jacob PEPPARD by another deed dated 4 Mar 1691 in consideration of a marriage to be had & which since took place between said John WILLETT and Hannah HOLFORD one of the daughters of Thomas HOLFORD Citizen and Baker of London… made the property over to Humphry WILLETT & William HUNT executors + Mary REILY (ow WILLETT, wife of Walter REILY, daughter of John WILLETT) as trustees. Said John WILLETT + Thomas HOLFORD, citizen & baker of London are both dead but left 3 daughters, Hannah WILLETT, Martha REILY (wife of William WELDON) + ?, to whom the interest of the property now belongs. Said Walter REILY is entitled to 1/3 of the said term, & he has also purchased the interest of L, Walter REILY now selling his 2/3 of the remainder of said 99 year lease to Jacob PEPPARD for £80. A free of the commitment to pay the £3 annuity & Jacob PEPPARD to pay 2/3 of the Quit Rent. 61 155 40941 1729 Jun 21 Deed: 61-155-40941. Rev Robert JACKSON of Tatham of Co Lancaster in Kingdom of Great Britain of 1 pt & Thomas MEREDYTH of Newtown, Co. Meath…. Transfer of land called Reisk 50 A bordering on Carlandstowne also land in Island of Emloguh WITNESS: Francis NORTH of City of Dublin & Wm FORSTER clk to NORTH. Whereby Jane JACKSON & Abigal BUCKLEY als JACKSON sister and heirs at law of the Rev. Robert JACKSON formerly of Tathcon [aka Tatham] in Lancashire ... set to John PIPPARD of Castletownmoor in Co. Meath Esq. Lands of Castletownmoor NOTE: Rev Robert JACKSON of Tatham aka Totham, Lancashire was a son of Nathanial JACKSON (1640-1698) and was a nephew of Samuel JACKSON. BTW Richard Toumalin NORTH of Fitzroy Sq., London eldest son of Miles NORTH late of Jackson Hall, Westmorland grandson of Richard NORTH husband of Jennet JACKSON one of the sisters of the Rev. John JACKSON minister of Skipworth in Yorkshire of the 1 pt. leased to Henry WARNER of Co. Louth 161a of Marvelstown,[Kilbeg Civil Parish, Barony of Lower Kells] (lots of description) Barony of Kells, … Robertstown [Kilbeg Civil Parish Barony of Lower Kells,] & West, Raffin East, [Drakestown Civil Parish, Barony of Morgallion] & Drakerath South [Parish of Staholnog, Barony of Lower Kells] Thomastown, [assuming it is the one in Kilbeg Civil Parish, Barony of Lower Kells]. WITNESSES: John HAWKINS and Henry RICHARDSON both of City of Dublin, Attorneys. NOTE: In the 1705 will of Samuel JACKSON Rev John JACKSON is described as a brother-in-law of Samuel JACKSON. This would makes him a brother-in-law to Jennet JACKSON. My rationale in looking at other JACKSON holdings in the Barony of Lower Kells is that there may have been block grants that got divvied up amongst family members. I doubt that it is merely coincidental that all 6 parishes border one another. Townland Ballynalurgan. Thomas JACKSON jun leased abt 103 acres. Townland Ballynaclose, Gordon JACKSON leased abt 34 acres and Thomas JACKSON leased two parcels of abt 25 and 43 acres. Townland Boynagh, Thomas JACKSON leased two parcels of abt 68 & 35 acres, and owned 2 small houses which were leased to tenants. Townland Lisnabo, Thomas JACKSON leased 184 acres, and also owned 2 small houses leased to tenants. 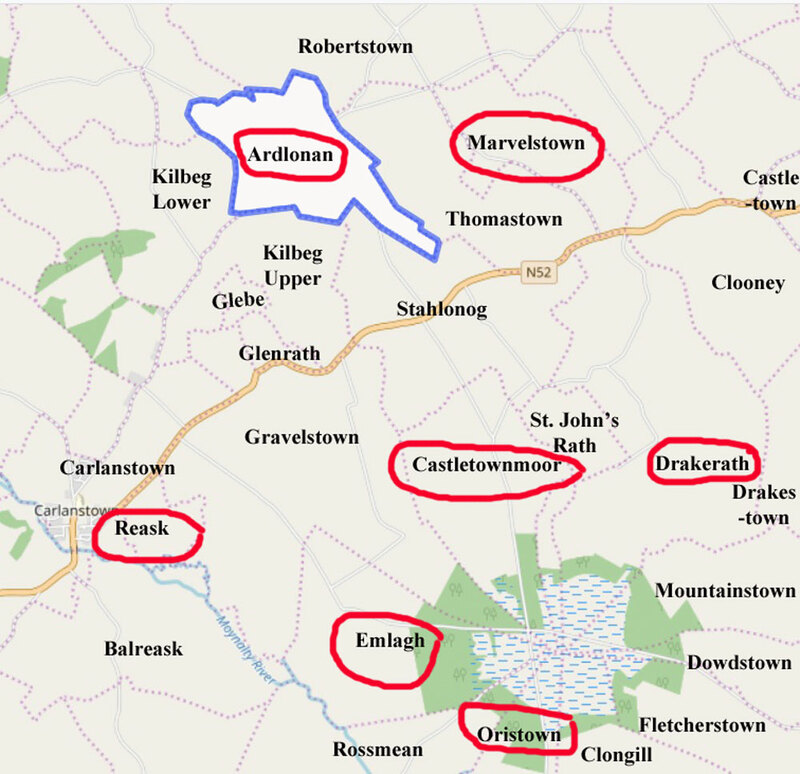 Townland of Rathe, Thomas JACKSON leased 374 acres, and also owned 3 small houses leased to tenants. Townland of Edengora, Henry JACKSON leased abt 28 acres and a house. The total of 1021 acres held by the extended family in these 3 parishes would indicate that the JACKSONs were amongst the more prosperous farmers in the region. They received passing mention in the 1834 Lewis Topographical Dictionary: The principal seats are Cabra castle, the handsome residence and richly planted demesne of Colonel Pratt; Corinsica, of J. Pratt, Esq. ; Northlands, of the Very Rev. Dean Adams; Newcastle, of J. Smith, Esq. ; Woodford, of J. Armstrong, Esq. ; Lisnaboe, of — Jackson, Esq. ; Plantation, of — Irwin, Esq. ; Larchfield, of W. Pratt, Esq. ; and Cornakill, of — Moore, Esq. 1757 Oct 10 for £180 Alisha AKIE to Charles AKIE, deceased of Rath in Nobber parish, Slane barony, Meath county from 1 May then past for remainder of term to come. Thomas JACKSON, Gent of Lisnaboe, Gent of the second part & Henry JACKSON, Gent of Lisnaboe, witness. Thanks to Mike Stewart. Memorial of a Lease for lives renewable for ever dated 31 August 1715, Thos Bligh, Brittas, County Meath Esq Ist part, Henry JACKSON, Lisnabow, County Meath, the other part. Recites a grant from Thos BLIGH to Henry JACKSON of sixteen poles Poles of Ballynaticknuff now in the possession of the said Henry JACKSON containing by common estimation 152 acres or thereabouts, situated in the Barony of Kells, County Meath with all Rights, etc. For #604 SEE: Jacksons of Lisnaboe See also: 1864 March 26 deed. 1715 Sept 1 JACKSON-FARRELL site research Lease for lives dated 1 September 1715, Thomas Bligh, Brittas, County Meath Esq. to Nathan Nesbitt. . .lives of Nesbitt family.. One of the witnesses was Henry JACKSON, Lisnabow, County Meath, Gent. Four Poles of Kinachan aforesaid now in the possession of the said Nathan containing by estimation two hundred and seventy three acres... with the Mills theron and all Milldams, watercourses and rights... yearly rent of £65 . delivered 1 Sept 1715 near 10:00 AM. SEE: Jacksons of Lisnaboe See also: 1864 March 26 deed. Mortgage 21 October 1737, Henry JACKSON, Lisnabow, County Meath, Gent and Hugh JACKSON, Ballybeain, County Monaghan, Merchant, 1St, Patrick Cassidy, Dublin, Gent the other part. Recites that the said Henry JACKSON by Lease demised unto the said Hugh JACKSON 40 acres of the said sixteen Poles of Ballynaticknuff at the yearly rent of £7 sterling during the term of the natural lives of the lives of the said Henry JACKSON and the said Hugh JACKSON. Witness that the said Henry JACKSON and Hugh JACKSON in consideration of £40 sterling did assign to the said Patrick CASSIDY all their Rights and Interests in the said lands and Towns together with their two several Leases, to hold by said Patrick CASSIDY during the lives of the said Henry and Hugh JACKSON. No JACKSON Witnesses. 1754 Dec 14 JACKSON-FARRELL site research Memorial of an Indentured Deed of Lease and Release dated respectively 4th and 5th days of November 1754, the Lease between Henry JACKSON, Lisnaboe, County Meath, Gent, 1st part, Thomas JACKSON, Lisnaboe son of the said Henry JACKSON, the other part. The Release between the said Henry JACKSON and Mary his wife, 1 St part, said Thos JACKSON, the other part. Reciting that the said Henry JACKSON and Mary his wife in consideration of the said Thomas JACKSON's paying the sum of £228 Principal money due by the said Henry JACKSON and £50 sterling interest thereon and the said Thos also paying unto Henry JACKSON, the Younger the sum of £50 sterling. Also paying the sum of £30 unto Jane JACKSON and £30 to Ann JACKSON and the sum of £10 sterling to the said Henry JACKSON, the Elder and Mary his wife during their lives and to the survivors of them and for the further consideration in the Indenture mentioned in the grant to the said Thomas JACKSON all the lands of Lisnaboe to hold forever. And did also grant unto the said Thomas all his, the said Henry JACKSON the Elder's, right and title to the lands of Rath, County Meath. To hold the lands of Rath during the term the of the Residue of the remaining years in said lease yet to come and unexpired . No JACKSON Witnesses. Thomas JACKSON of Lisnaboe Co Meath Gent of the one pt & Ann GORDON of Carrickmacross, Co Monaghan spinster of the other pt... marriage portion on lease of Lisnaboe... witness incl James JACKSON of Ballybea, Co Monaghan & Alexander GORDON of City of Dublin. One other parish that deserves being noted in connection to Samuel JACKSON in the Barony of Lower Kells is Cruicetown. Other than a William JACKSON acting as a witness, I see no evidence of this line of JACKSONs mentioned in leases here – yet – but the fact of so many of the names being tangentially related to him – PIPPARDs especially - is not to be dismissed. John PIPPARD of Drogheda Gent & Thomas RUTLAND of City of Dublin, Esq. With consent of Christopher PIPPARD ... townlands of Carrickroevaddy, Co. Down; Painestown, Co. Meath; Calliaghstown, Knockirk, Antelstown, Co. Meath, Cruicetown, Co. Louth ... brickhouse & malthouse, Drogheda. Cruicetown orse Cruestown orse Cruisetown, MEATH; Carrick Desart [40 acres 34 perches], MEATH; Piggshill orse Poeggshill & Rossboy orse Rushn__ee. NOTE: The convergence of names here is intriguing: Charles WALKER, Esq. Of Dublin City of 1st part; William Henry FORTESCUE, Rt Hon Lord Claremount, eldest son of Thomas FORTESCUE; Thomas FORTESCUE, Esq., late of Dillonstown, Lowth, deceased; Cadwalder, Rt. Hon. Lord Blaney, Baropn of Monaghan; Oliver PLUNKETT, Esq; commonly called Lord Lowth, of Lowth Hall, eldest son of Matthew PLUNKETT, late of Lowth Hall, ; Matthew PLUNKETT; Gorges Edward HOWARD, Esq. Of Dublin City; Matthew PLUNKETT, 2nd son of Matthew PLUNKETT; Suzanna PLUNKETT, late mother of [? ]; Mabella PLUNKETT, spinster, deceased, late daughter of Matthew PLUNKETT; Susanna PLUNKETT, spinster, of Dublin City, daughter of Matthew PLUNKETT Jane PLUNKETT, spinster, daughter of Matthew PLUNKETT; Plunkett Henry TALBOT, Esq. Of Dublin; Elizabeth TALBOT orse PLUNKETT, wife of Plunkett Henry TALBOT & daughter of Matthew PLUNKETT; Maybella TALBOT, spinster of Dublin City; Henry CONYNGHAM, Rt. Hon Lord Viscount; Gustavus LAMBERT, Esq of Beaupare, Meath; Francis GORMAN, Esq. Of Dublin; John O’NEIL, Esq. Of Shanes Castle; Charles O’NEIL, Esq. Of Shanes Castle; Thomas QUILSH - held part of lands of Carrick Desart Co Meath [40 a 34 p]; Hamilton GORGES, Esq. Of Catherine’s Grove; WITNESSES: Patrick DUIGENAN, Doctor of Laws, Trinity College; John ATWAY [aka OTWAY? ], mercer of Parliament St., Dublin; William JACKSON, Gent, of Dublin City ; John WADDY; REGISTER: John BURTON. Notes thanks to Mike Stewart. CONCLUSIONS? None as yet, but as I work through more inter-related deeds, I suspect a pattern will reveal the sub-plot of the whole story.